It was, until the very end, a mostly sleepy game at the Palestra on Saturday — not much of a surprise considering the Penn basketball team was facing a Division III squad over Thanksgiving weekend. 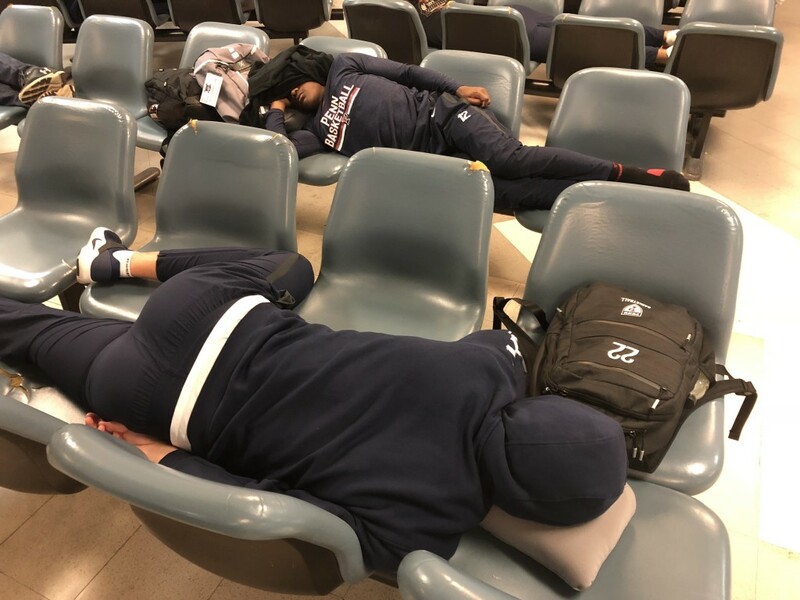 In other words, it contrasted considerably to the craziness of the previous week as Penn endured a pair of nightmare travel delays in between three tournament games on the U.S. Virgin Islands. In both cases, however, the Quakers showed the kind of spirit they think they’ll need to make the 2018-19 season a memorable one. Penn’s travel headaches began, as richly chronicled by sports information director Mike Mahoney here and here, last Thursday when they arrived at the American Airlines ticketing counter at Philadelphia International Airport, only to not get tickets until it was too late to make their flight. Head coach Steve Donahue was on the original flight and some of the key players were dispatched to others. 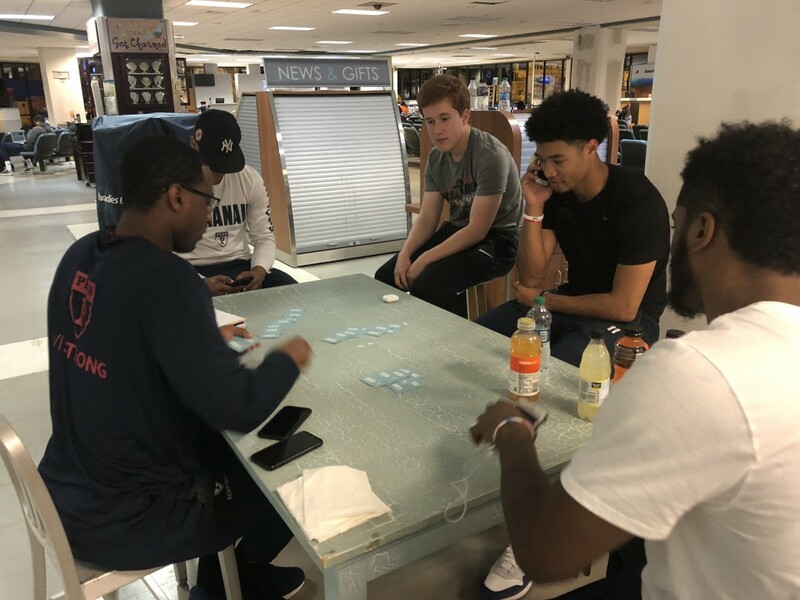 But for other players, along with coaches and staff members (16 people in all), they didn’t make it out of Philly until after 8 p.m., about 14 hours after they first left campus. One of those players was Kuba Mijakowsi, who enjoyed a nice moment a little more than a week later when he hit the three-pointer to put Penn at 100 points, triggering a promotion for fans to get a free burrito at Wahoo’s. 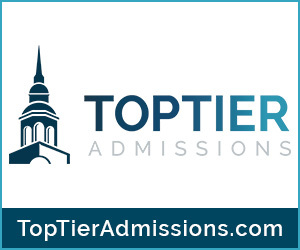 Yes, it used to be a free cheesesteak at Abner’s, as Nate Allison (1996), Dan Solomito (2002), Patrick Lang (2004), Brian Grandieri (2006) and Ray Jerome (2017) can all tell you after the hit the previous “cheesesteak shots” to put the Quakers over the century mark. Don’t blame Mijakowski, one of 13 Quakers to score Saturday, for treating overmatched Stockton like they were an American Airlines employee. He not only dealt with the brutal delay getting out of Philly but was hit with the double whammy of being part of the even worse situation leaving the Virgin Islands as the Quakers arrived at the airport at 11:45 a.m. and didn’t get back to Penn until the following night — almost 33 hours after the adventure began. “It was the craziest traveling experience, by far, that I’ve ever had,” Mijakowski said. “I thought that on the way to the Virgin Island and then it was even crazier. How do you have fun at a tiny island airport overnight? Mijakowski binged The Breaking Bad. Rothschild watched Scarface. Together, the guys played cards, or found wheelchairs to race around, or pushed together benches to take naps, or did other loopy things to pass the time. “We were wondering why this is happening to us,” Rothschild said. “All the other teams got to leave [except Old Dominion, which was on the same flight as Penn]. But life will always bring trials and tribulations. We can’t control that. We just have to control what we can control, which is our attitude. Donahue was certainly pleased to see how his players handled the unlikely and bizarre airport situation following losses to Kansas State and Oregon State at the Paradise Jam (after the Quakers began the tourney by defeating Northern Iowa to start the season 4-0 for the first time since 1978-79). “When you’re going through it, it’s a pain,” Donahue said. “But for the kids, school was basically not an issue, you’re with your best friends hanging out. For me, I kind of liked that part. It was interesting to see the group dynamics. ODU was there, and nothing against ODU, but their kids were kind of quiet and just trying to survive. 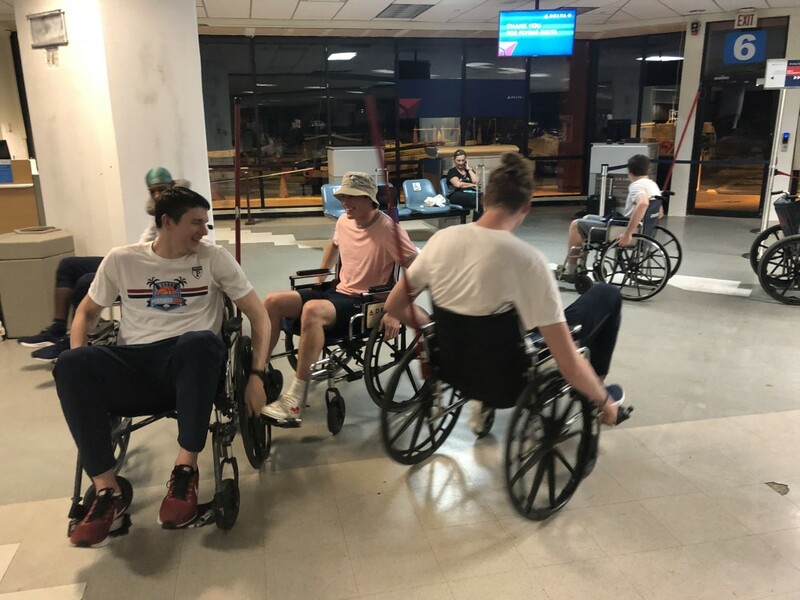 And our guys, to me, were making the best of it — having some fun, playing cards, having a sense of humor, wheelchair races, almost laughing at the fluid changes of the situation. And now, as assistant coach Joe Mihalich pointed out after Saturday’s game, a six-hour bus trip to Dartmouth might not feel quite as long.